I take pride in caring for my patients so they can properly heal and return to their daily lives without any pain. Dr. Infante is board certified by the American Osteopathic Board of Orthopaedic Surgery. He is sub-specialty trained in trauma, general orthopedics, and adult reconstruction surgery. He was born and raised in New Jersey where most of his family still lives. 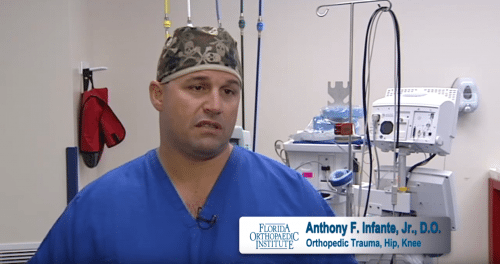 Apart from his clinic, Dr. Infante is involved with multiple organizations including the American Osteopathic Association, American Academy of Orthopedic Surgeons, Orthopedic Trauma Association, and serves as President of the Hillsborough County Osteopathic Medical Society. He has presented numerous lectures at the national level regarding lower extremity trauma and complex surgical procedures and has held positions as an Assistant Faculty Professor at the University of South Florida and Chief of Surgery at South Bay Hospital in Sun City Center. As Chief of Surgery at South Bay Hospital, he is responsible for the coordination and integration of policies and services within the department. Dr. Infante continues to treat complicated fractures, trauma to the extremities and pelvis, post traumatic and osteoarthritis. Common procedures Dr. Infante performs include arthroscopies and joint replacements for the shoulder, hip and knee. In his spare time, Dr. Infante enjoys traveling, fishing and playing with his children. Thank you for taking care of our daughter’s broken femur. We really appreciate the fast and well done work after this big car accident. Thank you to all the team and St. Joseph Hospital staff. I was in a bad car accident and broke my tibia plateau, which is the knee. I didn’t think I was ever going to walk again. I’m here to tell you that I am walking and doing very well. Dr. Infante did a wonderful job and I have minimal scarring from surgery! I was in a bad car accident and broke my tibia plateau which is the knee. I did not think I was ever going to walk again. I am here to tell you that I am walking and doing very well. Dr. Infante did a wonderful job and I have minimal scarring from surgery. The 1st time for a hip injection and the 2nd for scheduling surgery. My time frame can be a problem since I’m still working. Dr. Infante got me scheduled on one of his days off, so I would have the time to heal before I head back out to sea. This was above and beyond his duty and I greatly appreciated it. Since surgery I have recovered greatly, was riding my bicycle within 2 weeks and walking 2 miles a day after 1 week. After 4 weeks, completely recovered and could return to work without any restrictions. I fell and crushed my elbow and bones around the elbow, 12 years ago. Dr Infante repaired it, I had literally no pain. Six weeks later broke it again. Dr. Infante again gently and kindly repaired it, only this time in such a way I would not break again. After 12 years I am still using it like it never happened. Thanks for a wonderful job done long ago. My special needs daughter MyKayla was a patient of Dr. Infante she had a multi compound fracture in her left arm. He and his staff worked very well with her special needs and she is still talking about her favorite doctor to this day. Thank you to everyone that had a hand in her care. I fell and broke my wrist while at work and was referred to Dr. Infante by workman’s comp. It took some time to get the needed surgery due to some issues with the hospital and their staff but Dr. Infante was a very proactive advocate for me within the medical system. Dr. Infante and his staff was very supportive and pushed to get what ever was needed to get me schedules as quickly as possible. The surgery day, again the hospital had paperwork issues but Dr. Infante HIMSELF dealt with it and was very assuring to myself and my daughter who was caring for me that the surgery was being done THAT day. The surgery was performed without any problems and I left feeling confident. During the entire process, Dr. Infante took personal time to meet with me and my daughter as well as did Nicole his PA. I can not say enough about my POSITIVE experience with Dr. Infante and his staff. Liz his administrative assistant was also an invaluable asset to the office. She went out of her way to make sure paperwork was faxed and available during the numerous problems that arose due to the hospital. Although I NEVER plan to break another bone…..should I, I would again travel the hour plus to have Dr. Infante as my doctor and recommend him to EVERYONE that needs trauma care. Thank you to Dr. Infante, Nicole, Liz and the rest of the staff that touched my life during this surgery. Y’all are the BEST!